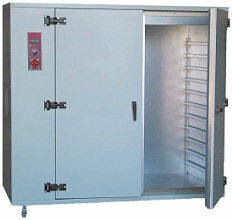 The GENLAB Large Capacity Multipurpose Ovens offer a unique range of highly efficient, reliable and accurate units suitable for much larger applications in drying, curing, general laboratory and industrial uses. All units have as standard a PID Microprocessor controller, with dual displays of set point and actual temperature that are auto-tuned to each individual unit to optimise the heat up, overshoot and control of temperature. The horizontal style ovens in this range are the LCO/9H/DIG,LCO/12H/DIG, LCO/15H/DIG, LCO/18H/DIG, LCO/22H/DIG, LCO/27H/DIG, LCO/30H/DIG, LCO/35H/DIG and the LCO/42H/DIG. 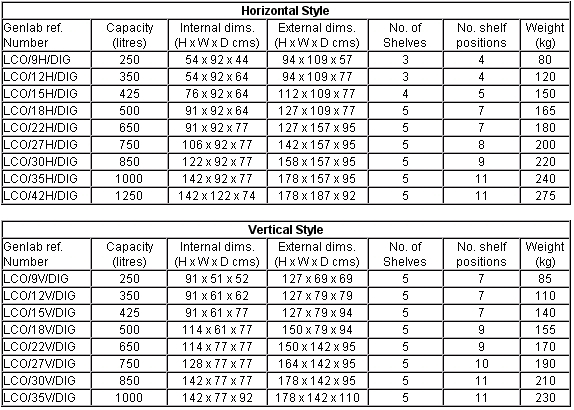 The vertical style ovens in this range are the LCO/9V/DIG, LCO/12V/DIG, LCO/15V/DIG, LCO/18V/DIG, LCO/22V/DIG, LCO/27V/DIG, LCO/30V/DIG and the LCO/35V/DIG. All units have CLAD interior with the microprocessor digital control as standard.